So, the 72nd Golden Globe nominations dropped last week. Some shocks, some surprises, some of this, some of that. As one of the stepping stones to the big Oscar show in early-March, mid-January's Globes provide a glimpse into the possible Oscar lineup. 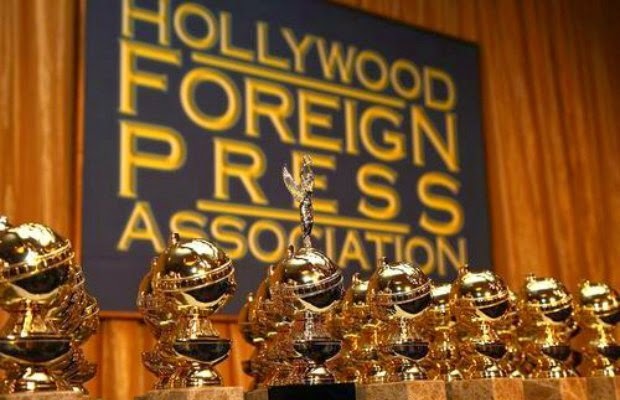 Many of the nominees of the Hollywood Foreign Press Association's annual awards go on to Academy glory. With a much more expansive range of big awards among the worlds of both film and television, the Globes are always a blast to watch. Back again to host on January 11th, 2015, are Tina Fey and Amy Poehler. It's gonna be a fun show. I'm going to focus only on movies here. I am caught up on so few new shows, that I would just end up writing about "True Detective" and "Fargo" and nothing else. I have my own personal 2014 Top Five in TV post in the works, so you can have my TV ramblings then. My reactions are underneath in orange. Well, you know, "Gone Girl" is not here and that really gets to me. Granted, I've not seen everything yet. In fact, the only one of these five that I have seen is "Boyhood," which was great but has lost steam with me recently. "Selma" seems to be the hot item right now, but I think "Boyhood" may take this one. It is winning with critics' associations all over the country. Now, I've seen three of the five here. Fairy tale musical "Into the Woods" releases at Christmas, and I haven't even heard of "Pride." I am so happy to see "The Grand Budapest Hotel" here. It's looking good to make the Best Picture field now, which is awesome. And "St. Vincent" is my heart-warming favorite. But "Birdman" takes this one, steadying its place on Oscar night. This is a tough one. I have not seen "Selma" and can't speak to DuVernay's talents, but the rest of these are really well-made films. Linklater has a good idea on his hands with "Boyhood," but I can't say his execution as a director is award-worthy. Fincher and Anderson are my two favorite working filmmakers, who made incredibly great movies. However, Iñárritu is the winner here (and on Oscar night). His work on "Birdman" is seriously unparalleled this year. Alejandro González Iñárritu, Nicolas Giacobone, Alexander Dinelaris, Armando Bo, "Birdman"
Screenplay is a tough one this year. I really have no clue, but I'm going to say that Linklater has a real shot here as does the crew who wrote "Birdman." Then again, Gillian Flynn's adaptation of her own novel is astounding and will most likely win the Adapted Screenplay category come Oscar time. Too close to call for me. Alas, another category filled with movies I haven't seen yet. At least this proves that all of these are to be seen. Gyllenhaal's performance in "Nightcrawler" is powerfully intense, but it is the only one I've seen. I've been hearing a lot about Carrell lately, and I think Redmayne and Cumberbatch are pretty much locked in for Oscar noms. How great to see Bill Murray and Ralph Fiennes here. I honestly thought "Grand Budapest" was going to end up forgotten with such an early release date, then I remembered how good it is. Fiennes would be a great win here, as would Murray. "Inherent Vice" waits in the wings as my most anticipated film of the year, which will most likely not be here until January. Keaton is winning this one, though, and will almost certainly sneak into the Oscar race. All of these performances have been talked up a lot this week. I think there is quite a bit of surprise around the Jennifer Aniston nomination. Other than that, I believe this could end up being the Oscar lineup. Rosamund Pike's performance is the only one I've seen at this point, and I am most likely not coming off her bandwagon. Helen Mirren, "The Hundred Foot Journey"
What a joke of a category! Filler filler filler. Where's the edge? Rose Byrne from "Neighbors" is the one I would've like to have seen. Tim Burton's "Big Eyes" is one I definitely want to catch come Christmas; "Annie" as well, though I feel like that nomination exists only for show. No offense the young Wallis, but I can't imagine her performance in this is truly award-worthy. The Globes missed the boat on her a couple years ago when she nabbed an Oscar nom at 7-years-old for my number two pick in 2012, "Beasts of the Southern Wild." I deliberately avoided "The Judge" due to some major bad press and some incredibly redundant, beggy TV spots leading up to its release. Duvall doesn't have a chance. The rest of these are extremely powerful performances, and I'm at a loss for picking a favorite. Hawke was my favorite thing about "Boyhood," and Edward Norton is the best part of "Birdman." But I believe the power of J.K. Simmons' maniacal music professor in "Whiplash" is just unmatched. He wins here and on Oscar night. Keira Knightly, "The Imitation Game"
I'm so happy to see Emma Stone on the list. Her performance is my favorite here, though I've only also seen Patricia Arquette in "Boyhood." Arquette is solid and has a good chance here. I can't comment on the others, but "A Most Violent Year" looks great from the trailer I recently saw. I think Meryl, once again, is being nominated for being in a movie. Tough call on this one for me. There you have it. The major nominees in the motion picture categories for the 2014 Golden Globes. I still have plenty to see, but this is certainly providing a definitive list of movies to catch in December and January. Happy Award Season! It has arrived. I feel like Boyhood is going to win a lot of awards (except the acting ones) merely on the fact that it was filmed over 12 years. They'll reward Linklater's dedication whether the film actually deserves it or not. As I turn it over in my mind, I really have an admiration for Boyhood, especially in its ambition. But, man, that kid was just such a whiner in the end. It bugged me. Up until the very last scene, the last half hour just drug on and on.